Limited by the availability of detailed observations, most historical evaluations of changes in freshwater ice have focused on relatively simple characteristics, such as the timing of autumn freeze up and spring break up, and maximum ice-cover thickness. 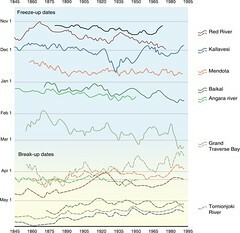 Based on 27 long-term (about 150-year) records from around the Northern Hemisphere, Magnuson and others (Figure 8.1) discovered that freeze up has been delayed by approximately six days per hundred years and break up advanced by a similar rate, resulting in an almost two-week per century reduction in the ice-covered season. Numerous other regional and continental studies have been conducted using the more spatially-detailed sets of observations available for the latter half of the 20th-century. 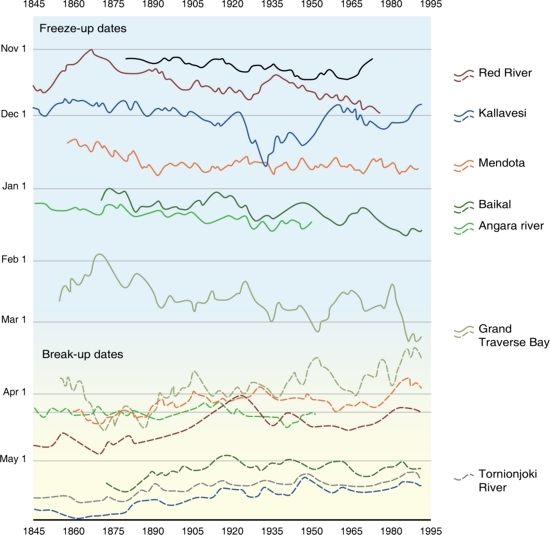 Results reveal strong contrasts in freeze-up and break-up timing between decades and between regions (see box on spring temperatures and ice break up) largely paralleling trends in major atmospheric patterns that have produced regional climatic warming or cooling.